There are 61 posts tagged emini trading (this is page 2 of 7). Stock Market Crash in 2018: Are We Recovering? In late January, many media outlets said that the U.S. stock market was strong and resilient. Record highs were hit. Within a couple of weeks, the Dow experienced one of its largest losses ever. Many consider this to be a stock market crash. What happened? We retail traders have been dealing with increased volatility during this time period, even through today. Much of the time, the E-mini’s ATR (Average True Range) has exceeded levels safe levels for day trading (based on our assessment rules). For example, when the ATR is between one and four points, trading conditions are acceptable. During this highly volatile time, we have seen the ATR push 20. What can you do? Sit on your hands, experiment, or engage in higher-risk trading. You can’t control the market or the conditions that may have caused the volatility. Yes, our methods have found many excellent trades, but if you decide to jump in on one of our signals, be very careful. A fast-moving market can easily flip direction and tag you out. If you’re going to trade, jump into simulation mode for a while first and get a feel for what it would be like trading with a live account. Interestingly, the 2018 January Effect seems to indicate that 2018 will be an up year. If that’s true (and there is basis for historical accuracy), then what does that mean for this period of bearish activity? Well, by watching the video above, the markets may now be on the rise. If that’s the case, you can use the January Effect method to get in before the market reaches new highs. Were you successful with any trades yesterday? The Atlas Line called out a clear winner, totaling about +2.5 points or +10 ticks. This short trade occurred in the E-mini S&P market at about 10 a.m. EST. The signal was generated at the close of the candle at about 2869. At that time, the Average True Range (ATR) was about 2.56. This is where we get the +2.5 profit target (round down to the nearest whole-point). While the maximum profit target may have been double that, once you’re in a trade, the rules say to closely monitor real-time conditions and adjust the profit and stop loss as you go. In some instances, an unexpected news event can dramatically increase volatility. If that happens, you may want to cut your losses and get out sooner than later. Fortunately, this trade was a winner with good volatility. When trading, getting in as close as possible to the signal price is recommended. In this trade, John Paul got in within a tick or so. If you were trading with five contracts, the profit would have been over $600. Of course, the amount of contracts one can trade with is impacting by one’s ability to properly fund a trading account. Practice is encouraged, then after exploring the risks of trading and consulting with a financial professional, starting off with one contract is probably the best option. Reduce risk exposure by staying in a trade as little time as possible. Get in and hopefully get out with profit. The Atlas Line’s rules limit each trade to about 20 min. Often times, you’ll get out sooner. Before the trading day begins, check the financial news schedule. Market-impacting events are published ahead of time. You may want to stay out until the volatility subsides. Measure your trading success by looking at long-term performance. Look at each month and objectively compare the performance. NinjaTrader has an account performance feature that is useful in this regard. If you are unsatisfied, consider a new approach. 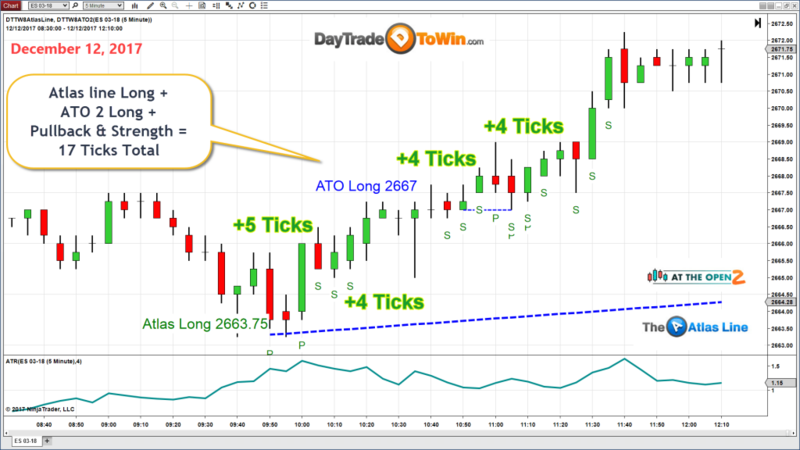 Traders have said how much they have enjoyed seeing videos of the ATO 2 and Atlas Line in use on one chart. Here is another recent video showing just that. The E-mini S&P is the market being traded here. The first signal that appears is an ATO 2 short. As John Paul has said previously, you take the first signal that appears. If you were in this trade and held onto it by the time the Atlas Line signal came, you could have placed another short or potentially increased your profit target. What’s interesting about this particular day is that many traders believed it was a bull market. Both of the DayTradeToWin.com indicators believed otherwise. When one trading system confirms another, John Paul believes there may be a better chance for profit. That said, no strategy or signal can guarantee profits. Trading is risky. See the green line at the bottom of the chart? That’s the ATR (average true range). It’s what John Paul is using to calculate his profit target and stop loss. It’s also what he uses to measure volatility. When the ATR is between two and four points, the conditions are ideal for trading. Above or below that, it’s either too volatile (likely due to a news event) or too slow (perhaps no big market movers are trading, it’s after-hours, or the date is near a holiday). Look to the right of the ATR and you’ll see the current value in the price axis. With a period value of four for the indicator, the ATR says the profit target should be about two points. The rules for determining the profit target and stop loss are taught in the included live training. Remember, a bullish market is expected if the January Effect applies. We will only know whether 2018 is a January Effect year by market close on January 31. In any case, you can always look for long and short trades using any of the trading methods taught in the eight-week Mentorship Program. All courses and software are included with lifetime licenses. Instead of having to travel to an office, DayTradeToWin.com brings the classroom to you. All lessons are live and are provided through an online trading room. Although John Paul is not calling out trades for you to take, he is teaching you how to be a trader first and foremost. If you want more time to review a particular topic, no worries. Because each class is recorded, you can always log in and watch a recording. Some traders prefer to start out with just one of the Day Trade to Win methods. For many, that’s the ATO 2. It’s simple design produces up to two signals per day on average. These signals occur soon after the market opens. On this occasion, we are looking at a winner of approximately six ticks. How did we figure that out? The profit target is based on the ATR (Average True Range), which is the green line that appears at the bottom of the chart. In effect, the market “allowed” for six ticks because of the recent volatility levels. Excluding broker fees and providing you got in and out at the right times, this trade could have been worth about $75 using one contract. If you trade with more contracts, then you can see how the winnings can add up. We explain all the details in the included training. We’re looking at a trending day here. Look at how both systems fired off winning signals before the market moved up. The Atlas Line signal appeared around 9:55 a.m. EST. If price did not hit the profit target, you would have left the trade using the time-based stop, 20 minutes later, at what should have been a profit. Soon after, the ATO 2 signal at 10:15 a.m. was worth around two points according to the ATR. A third winner was signaled by the ATO-C text. This indicates a “Trade Chaser” setup. Three winners before noon are not too bad for trading futures! If you followed the rules, it’s possible that you could have walked away with +17 ticks. TheAtlas Line produced its first signal around 9:55 a.m. US/Eastern (New York time). It was a long trade, which is a prediction that the market will go up. The real-time market conditions allowed for a profit target of around +5 ticks. After that trade, about three Atlas Line Strength signals plotted (the small “S” marks). Later, the ATO 2 and more Strength signals appeared. Both systems were in agreement the market would rise. They were correct! John Paul believes that similar signals from two or more trading systems may be a better predictor of anticipated price movement. Dec. 11 was another day when two systems agreed. In fact, the systems fire off signals around the same time. 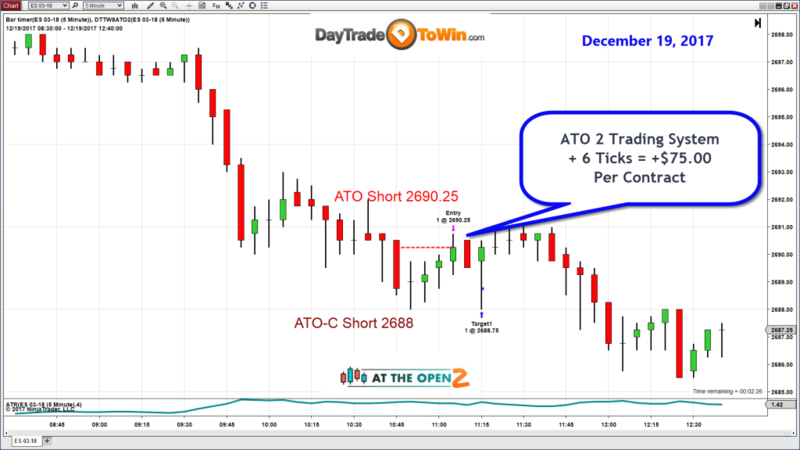 The ATO 2 trade came first, resulting in a possible +7 ticks. Around 10 a.m., a potential +6 tick winner appeared. The systems were also in agreement there were no trades later when the market began to chop around. DayTradeToWin.com received many emails asking when this video would be posted. Many traders attended and asked a number of great questions. On occasion, John Paul holds webinars such as these, where he publicly demonstrates his trading methods in real-time conditions. He also shares a number of trading tips and tricks. In these videos, see how the Atlas Line, Roadmap, ATO 2, and Trade Scalper faired in the E-mini S&P 500 (ES). Recently, the Atlas Line has a produced a number of great trades. In fact, John Paul showed what taking a live trade would be like based on a live Atlas Line signal. Another winning trade was placed later using the Trade Scalper. With many of the trading courses sold by DayTradeToWin, you receive a bonus. For example, the ATO 2 includes the bonus “How to Trail a Stop” video and the ABC indicator (which automates the method seen in the first part of the video above). The Trade Scalper comes with the X-5 strategy, which focuses on finding moves that are based on manipulation. The included live training teaches you how to combine the strategies to find the potential winning opportunities in the markets. The goal is to be a consistently successful trader. The ABC method works by dividing the trading day (as shown on an E-mini S&P chart) into an A, B, and C period. The A period is for the first 2.5 hours, extended from 9:30 a.m. EST to 12:00 p.m. EST. The B period is for the next 2.5 hours, from 12:00 p.m. EST to 2:30 p.m. EST (1430) The C period is for 2:30 p.m. (1430) until market close. Using NinjaTrader’s drawing tools, you can draw shaded regions that extend to the highest and lowest price points within each period. When price breaks out of the shaded region (such as two candles closing higher or lower than A’s region), you may be able to find a winning entry opportunity. The ABC software we provide as either part of the ATO 2 (as a bonus) or the 8-Week Mentorship Program automates the drawing of the shaded regions and the signals. Take a look at how the Atlas Line worked with the ABC strategy on Dec. 4. The Atlas Line produced a short signal earlier in the day at 2662. The angled, blue dashed Atlas Line advised for short trades throughout the day, as price regularly stated below the blue line. The ABC short signals confirmed this direction and allowing for a couple of winning opportunities. There were a number of great questions asked by attendees, so be sure to watch the entire video and the forthcoming second portion. Are these long trends in the market the result of optimistic holiday consumer spending expectations? Watch the trading video to see what happened on November 21, 2017 in the E-mini S&P. The January Effect rules confirmed a long (buy) trade was occurring. Remember, a retracement to the 50% level or exceeding past highs can trigger the long trade. The January Effect is not software based – you have to manually look at a daily chart and find the trades with your own eyes. When you switch to a 5-minute chart and use a signal software indicator like the Atlas Line, you can look for complimentary long signals. If these signals match the trend up, then John Paul believes you have a solid indication to buy the market (go long). Not every trade will be a winner. There’s risk in trading and it’s important to know what to expect. John Paul recommends only trading with money you’ve set aside for high-risk investments (i.e. don’t day trade your rent). One of the great things about DayTradeToWin.com is that they help provide you with a full practice environment that encourages simulated trading. In live sim trading mode with NinjaTrader, you can get a feel for how the methods work without taking on any financial risk. If the results look good to you over a period of time, you may then want to consider trading with a live, funded account. For some traders, this may take a couple weeks. For others, a couple of months. It’s all up to you, how much time you have to practice, and how quickly you want to take it. As a reminder, the market can be rather slow around major holidays (such as Thanksgiving). Expect today (the Friday after Thanksgiving, aka “Black Friday”) to be slow. Perhaps next week, with the result of customer purchasing reports, we will see higher than usual volatility. Black Friday and “Cyber Monday” may be used to initially estimate consumer spending patterns for the rest of the holiday season. Within the last few months, Forbes reported that consumer spending over Black Friday weekend is forecast to grow by 47% year over year. RetailMeNot, possibly the largest coupon website, reported that over 50% of its users intended to make a purchase on Cyber Monday. Right now, it looks like the E-mini S&P is on its way up. John Paul says this with confidence because of his belief in the January Effect and its trading predictions. The January Effect is a predictive method for the direction of price throughout the year. Although there are no performance guarantees, John Paul believes in the method’s consistency. Because 2017 is considered an “up year” by the technique, traders can look for long (buy) trades when price begins to retrace to previous highs. This may seem difficult to understand, so take a moment to watch the video. A new high was recently reached and price dropped soon after. Now that it seems price is moving back up again, we can use NinjaTrader’s Fibonacci tool to assist trading predictions and find the halfway point from the recent low to the recent high. This 50% level is the threshold for the entry. Once price surpasses that level, it’s time to look for entries. Some traders prefer to wait until price rises above the recent high, believing this serves for additional confirmation. The January Effect says that 2017 will close higher. This means that price may continue to rise throughout November and December. It’s likely that price will also drop at times, which only sets up opportunities for additional January Effect trades. If you are looking for intraday moves based on the January Effect, consider using the Atlas Line. 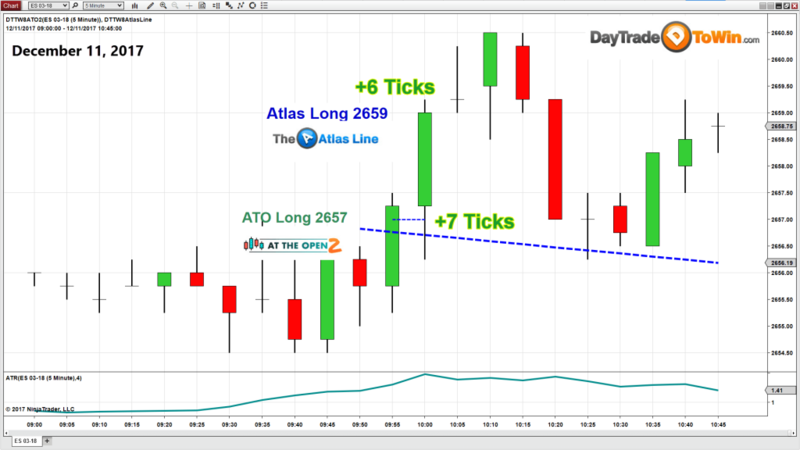 The Atlas Line produces signals and estimates where the market will head on a given day. If the January Effect is telling you to go long and the Atlas Line is comparable, then perhaps it is wise to follow the compounding signals. At about two minutes into the video, you can see how the Atlas Line called out a nice big move before it occurred. Will we see more trending patters to the long side? We will have to listen closely to what the market tells us. Interested in learning more? We have another eight-week trading school session starting January 21, 2017. All of our techniques are taught. You will get all the courses and software. Click here for details. Not all day trading indicators are the same. 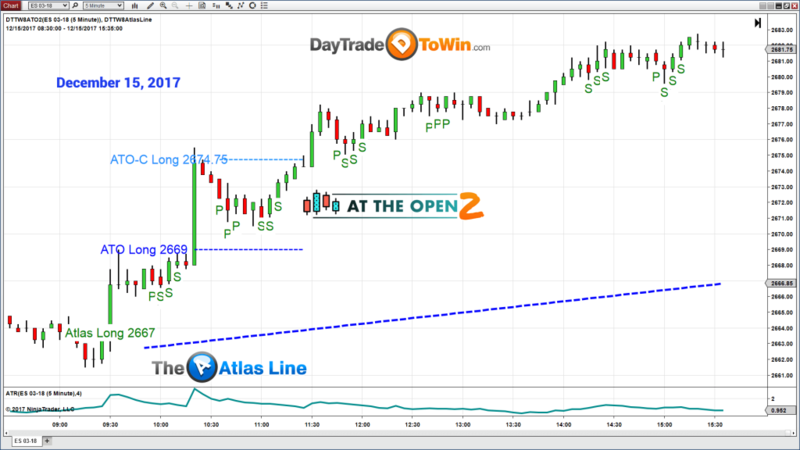 You can somewhat classify the Atlas Line from DayTradeToWin.com as an indicator, but it has qualities that make it a comprehensive trading system. For example, you’re taught how to manage each trade: profit targets, stop losses, and how to ride each trade out. You’re taught how to validate market conditions in order to know whether trading is too risky and if you should stay out. The indicator is also more forward-looking than others, meaning that its signals are meant to be used for the near future instead of constant optimization from past inputs. Truly, the Atlas Line is in its own league. Let’s look at this chart and trading video recently published by DayTradeToWin.com. What’s the first thing that catches you? For me, I notice how price chopped back and forth in a channel. If I was hoping for a trend or trying to pick tops and bottoms, I would have probably found a significant loss. The Atlas Line appears to have been successful in finding opportune moments for its entry signals. Just look at all of them. Only one of them appears to be a losing trade. That’s not bad – five out of six were winners. Note that your live trading results may vary. If market conditions were exactly as shown and you followed the strategy perfectly, you should have won around +24 ticks, which is about $300 USD, before any broker or other trading fees. Not bad compared to the other day trading indicators that are out there. What can be said about each of these trades? Well, the profit targets are all at one point or more per trade. When you look at the ATR (Average True Range), you can see what that is. The ATR reached two points earlier in the day then dropped later on. This is common behavior in the E-mini. You see, the Atlas Line uses a dynamic value for the profit target and stop loss. If market conditions are good, you will pretty much use the current ATR value as the profit target. And for the stop loss, you will double the ATR value. That is the largest stop (the catastrophic stop). The goal, of course, is to get out at profit. If a loss occurs, you hope to get out at a smaller profit, breakeven, or a smaller loss (using whatever stop strategy comes into play first).